If you live in one of the states where sports betting is already legal, and you’re looking for a rooting interest in the NFL Conference Championship games Sunday, WTOP's Chris Cichon has some tips to share. Sports betting is becoming more commonplace and accepted in the U.S. as a number of states and D.C. have taken action over the past year to legalize it. If you live in one of the states where it is already legal, such as West Virginia, Delaware, New Jersey and Pennsylvania, and you’re looking for a rooting interest in the NFL Conference Championship games this Sunday, here are some tips to consider. “Teasers” are won when the bettor is on the right side of 2-4 different scenarios involving spreads and game totals that offer much better odds than a straight-up bet against the spread. For example, the New England Patriots are three point underdogs (+3) against the Kansas City Chiefs. If you think the favorite Chiefs are going to win at home but you’re worried that might be accomplished by a late field goal that only gives them a 1-2 point victory, it might be smart to include the Chiefs getting points in a teaser. So, let’s just say you choose to wager a standard two team teaser that offers you seven additional points in favor of Kansas City. You would get Kansas City at +4 (seven point difference from the spread) and would need to be right on that along with another play. You could look at the NFC Championship Game, and take the Rams +10.5 or you could grab the Saints +3.5. You can involve totals in your teasers as well. There have been concerns about an arctic blast that was set to hit Kansas City, which caused a lot of early action on the under 56.5. However, as the week has moved along, the weather forecast has improved, and maybe you believe the score will be similar to the 43-40 shootout we saw when these two teams last met in October. Maybe the 56.5 total still scares you a bit, but you feel like they’ll come close, maybe a score 27-24. The teaser total will be seven points less than the actual total, so if the total at the time you are reading this is 56.5, it will be 49.5 in a two team seven point teaser and you would hit. There are three and even four team teasers that will offer you even better odds to cover your bet, but you will need to hit all three or four legs. The Big Chee Teaser Special Sunday: I personally believe that despite the fact that New England will have to try and defend an explosive Chiefs offense led by Patrick Mahomes, who threw for a league-leading 50 TD passes during the regular season, Tom Brady and Co. will advance to the Super Bowl for a second straight year. I will be pairing Patriots +10 along with the Rams +10.5. If one were to place this wager risking $50, the payout would be $38.46 as it stands now, if both bets hit. These type of bets are much more difficult to hit on, but the payout is much sweeter. In a parlay, you are wagering on multiple teams and/or totals with the spread unchanged from what the sportsbook is offering. So, if you think the Rams lose by less than four points and New England keeps it within one to two points or outright wins, you can combine these two plays for a higher payout. A $50 two team parlay with Rams +3.5/Patriots +3 would payout $130. Definitely high risk/high reward, and I personally will not be engaging in any type of parlays this weekend. Pretty simple: Pick the team who wins. If the side you like is the underdog, you are going to make more than you risk if you hit. If you pick the favorite, let’s say the Saints on the moneyline, you would need to risk $85 to win $50. The AFC Championship game is the perfect example of where “buying” a half point might make some sense. 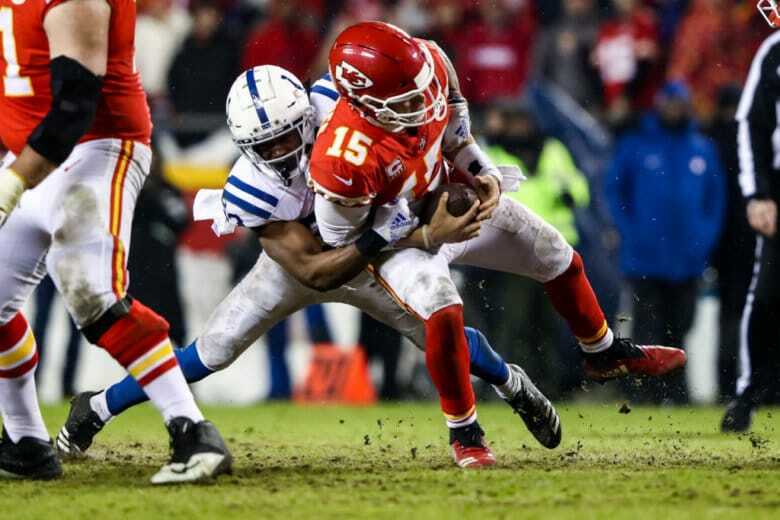 If you want to win $50 on Chiefs -3, you must risk $55. If you want to win $50 on Chiefs -2.5, you must risk $65. I haven’t even broached team totals (betting on how many points an individual team will score), live betting (where odds are created during the game, where you have a small amount of time to get in a play during a stoppage of play) and, last but not least, the ol’ fashioned betting against the spread. There you go; I’m on both underdogs this weekend, which was a good strategy in the wild-card round, but not so much last weekend. Good luck to you, and if you plan on driving out to Charlestown Racing & Slots to place a wager and need some additional help, tweet me @TheBigCheeShow and I’ll do my best to guide you in the right direction!